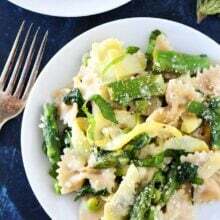 Spring Pasta Salad-this healthy pasta salad has all of your favorite spring vegetables-asparagus, peas, artichokes, and spinach! It is great as a main dish or side dish! I was in full spring mode until we got a huge snow storm last week. Utah almost always gets a big spring storm, so I shouldn’t have been too shocked, but since we didn’t get much snow during the winter I was hoping it would skip us during the spring. No such luck. I was not happy when I woke up to a winter wonderland. Oh well, we need the snow and Caleb and Josh had fun building a snowman. And luckily it melted quickly. Yay for sunshine! Spring is back…and I hope it is here to stay! One of my favorite spring meals is this Spring Pasta Salad. It is easy to make, pretty to serve, and good for you too! To make the salad, I use DeLallo’s Organic Whole Wheat Farfalle. We are whole wheat pasta fans at our house and DeLallo makes the best! 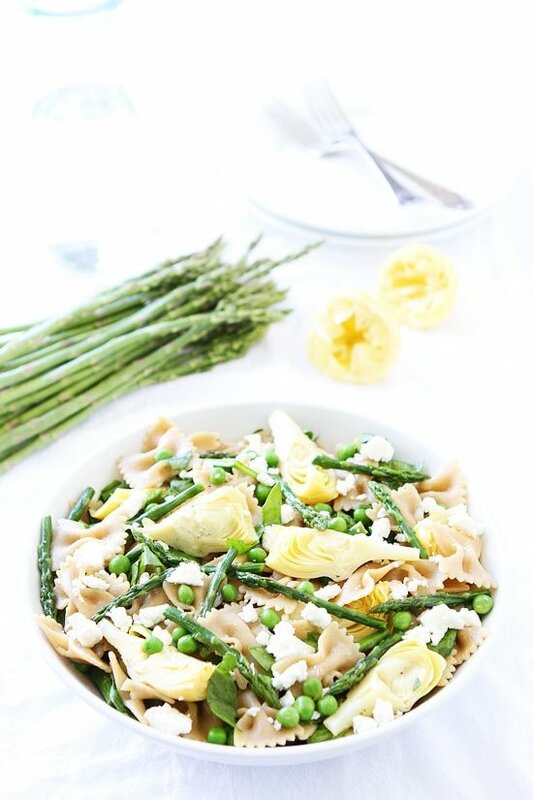 The butterfly pasta is perfect for spring, but any shape will work! Caleb likes to make the butterfly wings flap and I am ok with that since he gobbles it up after he is done playing. Food should be fun! 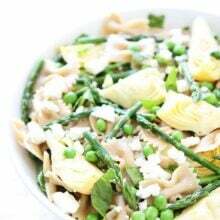 I add all of my favorite spring vegetables to this pasta salad: asparaugs, peas, artichokes, and spinach. I love all of the green! The dressing on this pasta salad is super simple and light. I drizzle the salad with olive oil and fresh lemon juice. I top the salad with fresh basil and feta cheese and that’s it! This salad doesn’t need much. It is tasty as is! 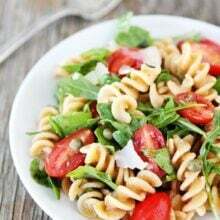 You can enjoy this Spring Pasta Salad as a main dish or side dish. It is perfect for potlucks, picnics, or parties! I like to make it for dinner and enjoy leftovers for lunch. Cook once, eat twice, works for me! 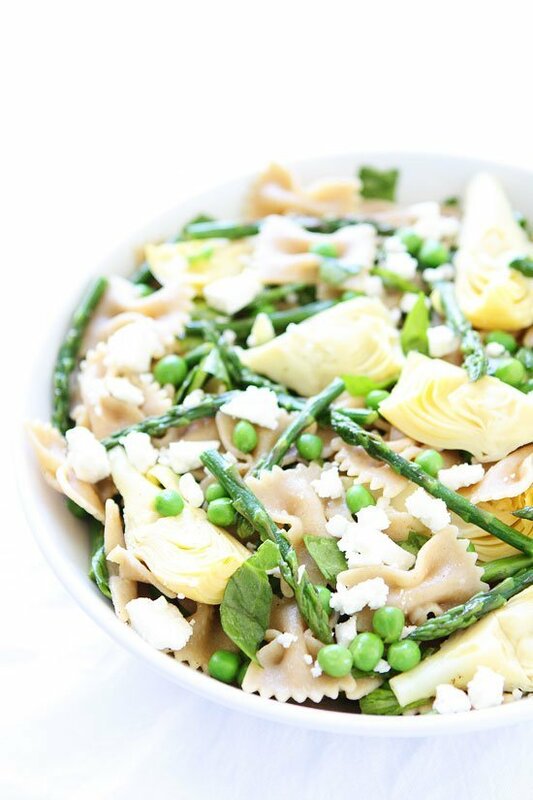 Get your spring on and make this fresh and healthy Spring Pasta Salad! This fresh, simple, and healthy pasta salad makes a great spring main dish or side dish! It is the perfect salad for potlucks, parties, and picnics. Bring a large pot of salted water to a boil. Cook pasta to al dente texture, according to package instructions. Three minutes before the pasta is done cooking, carefully add in the asparagus pieces. When the pasta is done cooking, drain the pasta and asparagus. Rinse cold water over the pasta and asparagus. Pour the pasta and asparagus into a large bowl. Drizzle with olive oil and stir. Add the spinach, peas, artichoke hearts, lemon juice, feta cheese, and basil. Toss until combined and season with salt and black pepper. Serve! Note-the pasta salad will keep in the refrigerator for up to 3 days. If storing it in the fridge, freshen it up with an extra drizzle of olive oil and squeeze of lemon juice before serving. Disclosure-this post is in partnership with DeLallo Foods, but our opinions are our own. Thank you for supporting the brands that continue to make Two Peas and Their Pod possible. This is definitely a perfect spring salad! Man–I’m sorry you had to deal with a spring snowstorm. That would bum me out. 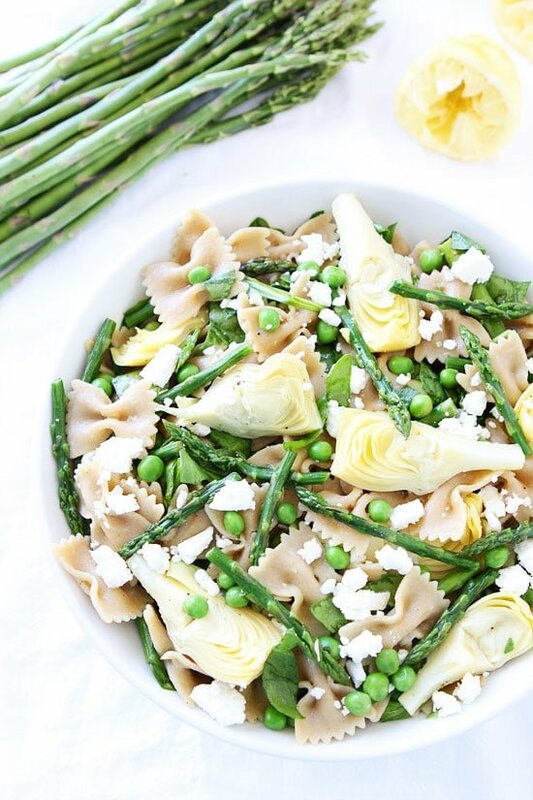 Seriously loving the spring colors in this dish and any pasta with feta is a winner in my book! 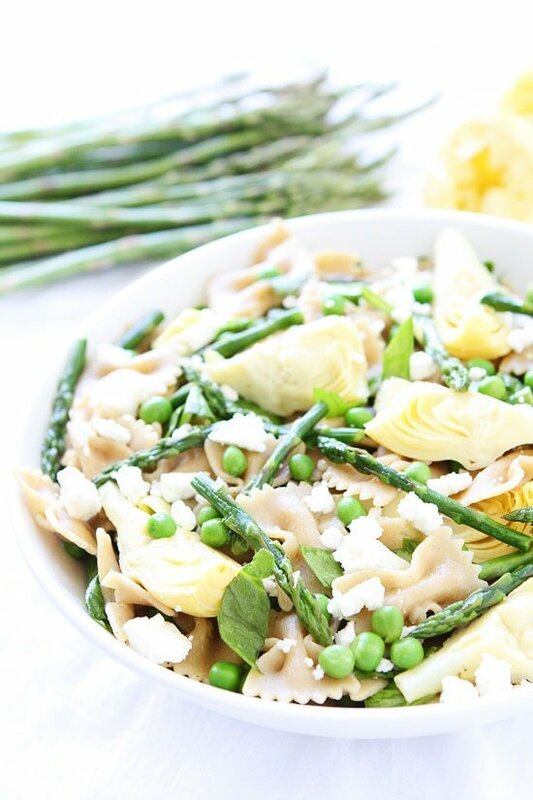 Loving how healthy this is and how its made with whole wheat farfalle! I can’t believe you’ve recently had a snow storm! Makes me feel guilty for whining about the cool 68 degrees I’ll be facing today. 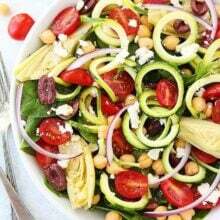 But I love that Spring is in the air (although my allergies don’t), and I love this fresh and light vegetable pasta salad! All of my favorite veggies combines with bowties and feta cheese. Yum! Great recipe! this looks so cheerful and fresh! A perfect Spring dish! That’s one nice spring pasta salad! That happened to us, too! It snowed for a hot second this morning and I got so sad. I think I need this spring salad in my life to cheer me up. Pinned! A beautiful bowl of spring indeed! Love the asparagus in this! This definitely looks like spring in a bowl!! Wow! This is such a fresh and flavorful dish! Thank you for the lovely salad recipe. Sounds good. Will totally be making this for all of our spring picnics! Healthy, delicious and full of so many of my favorite ingredients! A must try spring salad! This looks so fresh! I love pasta with peas! I love pasta, all pasta really. I especially love when it is healthy. Can’t wait to try this! This is an awesome recipe!!! Love this! Gonna try this one tonight. This pasta salad is going to happen soon! Delicious!!! This is such a springy, light salad. I love the asparagus and artichokes. Great combination! 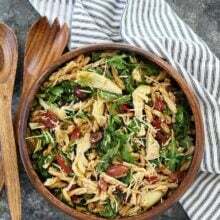 My husband and I were planning to have this beautiful pasta salad for dinner tonight, and then it really started snowing late this afternoon. We used your recipe, with half the pasta and made it into a hot entree. Crazy Good! Thank you for inspiring our cozy, comforting and tasty dinner. Yum! I just made this for game night with my husband and another couple. Usually, I end up spending the first hour they’re here “finishing up” supper, but this was ready to go before they even got here. I did substitute green beans for the asparagus, since that’s what we had on hand. I added about a tablespoon of fresh chives as well. It’s delicious. I’m surprised how well just a little olive oil and lemon juice worked out as a dressing.